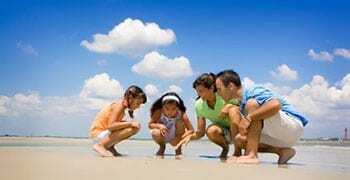 Southwest Florida is well known for both its beautiful weather and its plentiful opportunities for enjoying such weather with family and friends. Year-round residents, as well as visitors from all over the world, are able to take advantage of this stunning area and participate in their favorite outdoor sports and activities nearly every day of the year. Boaters, fishermen, golfers, scuba divers, and swimmers all feel right at home here – essentially anyone that loves sunshine and an abundance of both freshwater and saltwater areas to explore. With two of the best beaches available in all of Florida located right in Cape Coral, it’s no wonder this city is a popular destination for outdoors lovers of all kinds. While the Cape Coral Yacht Club Community Park might sound like an exclusive country club for Cape Coral’s wealthiest residents, it’s actually one of the city’s oldest standing landmarks. Originally built in 1958, this very public park is situated directly on the Caloosahatchee River and features an exciting array of amenities. While the ballroom or beach pavilion is available to rent for private parties, BBQ’s, and weddings, daily or casual visitors can always enjoy the community pool, fishing pier, and the beautifully landscaped public beach and surrounding nature preserve. Cape Coral’s Four Freedoms Park hosts the area’s newest beach which overlooks the beautiful Bimini Basin. Cape Coral residents and visitors of all ages can find something to enjoy at Four Freedoms, even if sun-bathing while enjoying the view of the boats in the marina isn’t your thing. This 320 acre park offers picnic tables, a fenced in playground, and a multipurpose recreational facility that hosts various events and programs throughout the year – perfect for those residents that love to stay active. Living on the water offers many benefits, and, fortunately, the city of Cape Coral offers a plethora of opportunities to reap these benefits in style. After a visit to Cape Coral, you will quickly see for yourself why this area only continues to grow in popularity each year, attracting people of all ages and lifestyles.